TEMPE, Ariz. (AP) — Arizona State became known as Guard U during its run to the NCAA Tournament a year ago. Led by three senior guards, the Sun Devils run-and-gunned their way into the bracket for the first time in four years. Now that Tra Holder, Kodi Justice and Shannon Evans II are gone, Arizona State will rely on a new, bigger batch of guards. The Sun Devils have transformed into Big Guard U in their bid to reach the NCAA Tournament in consecutive seasons for the first time since 1980-81. “We’ve got some bigger guards, guys with size who can handle the ball and make plays,” said Sun Devils forward Zylan Cheatham, a San Diego State transfer who’s eligible this season after sitting out 2017-18. Holder and Evans were 6-foot-1 and Justice was 6-5. 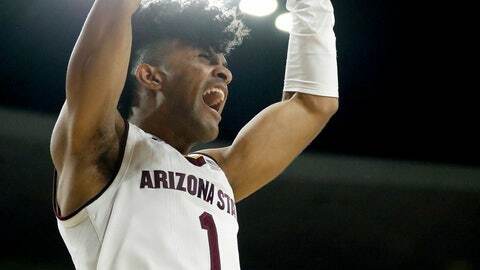 They played with confidence, quickness and were superb shooters while leading Arizona State to a 20-win season and its second NCAA Tournament appearance in nine years. Remy Martin, a 6-foot sophomore, returns this season after providing a spark off the bench and will be joined by a much bigger group of guards. Rob Edwards, who sat out last season after transferring from Cleveland State, is 6-4. So is Luguentz Dort, a talented freshman from Montreal. Elias Valtonen, a Finnish freshman, is 6-7. The big guards complement a frontcourt that’s bigger as well, giving coach Bobby Hurley a bevy of lineup and playing style options for 2018-19. That hasn’t been the case in the desert before this season. Arizona State had a thin bench and not a lot of size, so Hurley often had limited lineup options. When the season turned to the Pac-12 portion, the Sun Devils were often overmatched size-wise, with Justice sometimes giving up six to seven inches to players he was trying to defend. Arizona State won’t have that problem this season. The Sun Devils have depth and size from the guards to the frontcourt players, up to 7-foot Serbian freshman Uros Plavsic. Instead of facing matchup problems, Arizona State will create them with nine players 6-7 or taller. Arizona State’s size in the frontcourt should lead to better rim protection. The combination of Martin and Dort could end up being the best defensive backcourt in the Pac-12. Martin arrived in the desert last year with a reputation of being a hounding defender and he lived up to it as a freshman, playing with a boundless, aggressive energy that gave opposing guards fits. Dort has a similar makeup, only in a bigger frame. Dort is a relentless defender who’s good one on one, off the ball and flying in for weak-side blocks. He’s already impressed Hurley in a short time at Arizona State.